Pearl Avery, David Barker, Stuart Bloom, Keith Bodger, Mick Collins, Simone Cort, Fraser Cummings, Richard Driscoll, Richard Gardner, Kay Greveson, Barney Hawthorne, Tariq Iqbal, John Mansfield, Ben Morison, Rafeeq Muhammed, Kajal Mortier, Susan Murray, Glynn Owen, Aimee Protheroe, Ian Shaw, Jeremy Thorpe, Jessica Watts. You can find slides from this year’s Roadshow here. The Registry has a vacancy for a Caldicott Guardian to support all Information Governance aspects of the project. Please contact [email protected] for more information. It is great to see numbers continuing to grow thanks to your efforts. Site participation has increased from 25 to 38 over the past 6 months. Total records submitted are currently at 27,870 and this is predicted to rise above 30,000 over the next two months. There are now 94 live sites. 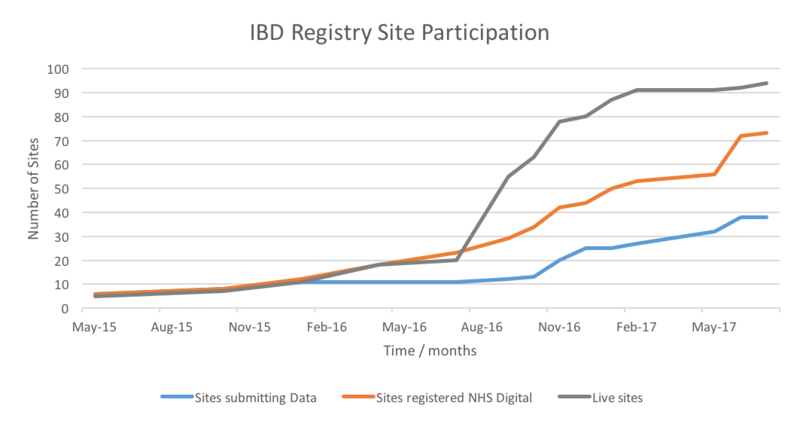 Of these 73 are registered with NHS Digital and a further 38 are submitting data. Thank you to everyone who uploaded data to NHS Digital at the end of June. The quarterly reports will be made available in the next few weeks. Participating sites will receive a summary profile of the data they submitted to the Registry. Sites that are also uploading data as part of the Biologics Audit will also receive a summary showing compliance with the KPIs. Teams who missed the deadline will receive an example data report. The next data submission deadlines are 30th September and 29th December. If you need any help at all in preparing for this, or if you have not yet registered with NHS Digital, please email [email protected]. Dr Falk Pharma are hosting a Falk Forum on IBD & e-health – New Paradigms for service delivery on the 22nd September 2017 at Midland Hotel, Manchester. The meeting will explore the new opportunities that e-health provides, and will include further education, introduction to social media and practical take home messages. Richard Driscoll will also talk about how to join the Registry. To register please go to www.drfalk.co.uk/falk-forum-59. Core and Dr Falk are running an award, open to UK-based gastroenterology specialty trainees who would like to conduct an audit or quality improvement project in gastroenterology, liver disease or nutrition. The deadline is 17th November 2017. To apply, visit http://corecharity.org.uk/research/research-awards-information/. Tillotts IBD Nurse Education Day and Recognition Programme will be held on the 17th November 2017 in Solihull. The Education Day is practical and engaging event for IBD nurses, with broad, relevant educational content and discussion. The IBD Recognition Programme recognises nurses or teams who have developed an innovative project to improve patient care in IBD. For more information please email [email protected]. Deadline for entries is the 8th September 2017.